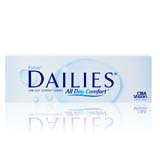 The Focus Dailies 30 Pack contact lenses are one of the most popular brands to buy on the market today. This is because the daily feature of these contacts is a major advantage and the comfort throughout wear is superb. Daily means that these contacts are disposed of at the end of each day of wear. This means that there is no maintenance required to keep the lens in wearable condition. These contacts include AquaRelease along with a time-released lubricant to keep the eye moist and comfortable throughout the whole day of wear. The AquaRelease feature is a blink-activated agent that releases as tears pass the lens, which moisturizes both the lens and eye. These contacts are tinted for easy handling in solution, but the tint is so light that it will not affect the color of the eye. The ease of using daily contacts makes the Focus Dailies 30 pack a great option to examine when buying contacts for a month.